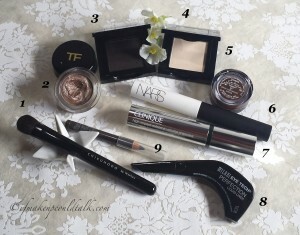 Chikuhodo Z-5 Eyeshadow Brush, Tom Ford Platinum Cream Eyeshadow, Bobbi Brown Espresso Eyeshadow, Bobbi Brown Bone Eyeshadow, Givenchy 9 Brun Cachemire, Nars Eyeshadow Primer, Clinique High Impact extreme Volume Mascara, Milani Liquid Liner, and Shu Uemura 02 Seal Brown Brow Pencil. Chikuhodo Z-5 Eyeshadow Brush is a wonderful multi-purpose brush–fantastic for application of lid color, crease color, lower lash line color and to blend out any harsh edges. Tom Ford Platinum Cream Eyeshadow applies like a dream and lasts all day (seen here). Bobbi Brown Eyeshadow in Espresso (discontinued, but Rich Caviar comes close) is used along the lash line for a smoldering eye look. Bobbi Brown Eyeshadow in Bone is an everyday essential used to highlight the brow bone, blend out harsh edges and as an all-over lid color. Givenchy 9 Brun Cachemire (reviewed here) is used everyday along the lower lash line and occasionally, as a lid color. Nars Eyeshadow Base makes any eyeshadow adhere brilliantly to the skin. I seriously will never be without this tube of wonder. Clinique High Impact Extreme Volume Mascara was once upon a time not my favorite mascara, but how a new tube can change the most cynical perspective. It does exactly what is stated on the tube. Love it! Milani Eye-Tech Perfection Liquid Liner is blacker than black, stays on all day and is a true drugstore gem. The formula and color are very comparable to Tom Ford Eye Defining Pen (reviewed here). Shu Uemura 02 Seal brown is my perfect brow color. This pencil is going strong even after 2½ years of consistent use. Milani Brow Gel (not photgraphed) is great for keeping brow hairs in place. Current Favorites–Eye and Face Makeup. Chikuhodo Cheek Brush, Cargo Water-Resistant Bronzer, Giorgio Armani Blush #10, Lancome Teint Idole Makeup 340 N, Wayne Goss 01, Chikuhodo Highlighter Brush, Too Faced Chocolate Bronzer, and theBalm Mary-Lou Manizer. Chikuhodo Z-8 Cheek Brush reviewed (here). Cargo Water-Resistant Bronzer was originally purchased for use as a bronzer; however, the high shimmer factor has deemed this product suitable for eyeshadow use only. Love to use it on the lower lash line. Giorgio Armani Blush #10 Blush is my all time favorite blush (reviewed here). I like using this blush with a dampened brush for more intense color and long-lasting wear. Lancome Teint Idole Foundation in 340 Bisque (N) is giving my Estee Lauder Double Wear a run for its money. I adore the lightweight, full coverage, non-drying formula. Wayne Goss 01 Brush (reviewed here). Chikuhodo Z-2 Highlighter Brush (review coming soon)….can you guess my thoughts? 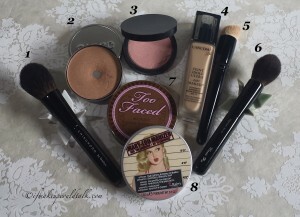 Too Faced Chocolate Bronzer is one of my favorite bronzers…my compact is over two years old and still going strong. theBalm Mary-Lou Manizer is a seriously illuminating highlighter–a light hand and a proper brush are strongly recommended. YSL #11 Prune Impertinence, Dior Addict Fluid Stick 893, 975 Minuit, 219 Whisper Beige, Estee Lauder Pure Color Envy 210. YSL Baby Doll Kiss and Blush #11 Prune Impertinence (reviewed here). 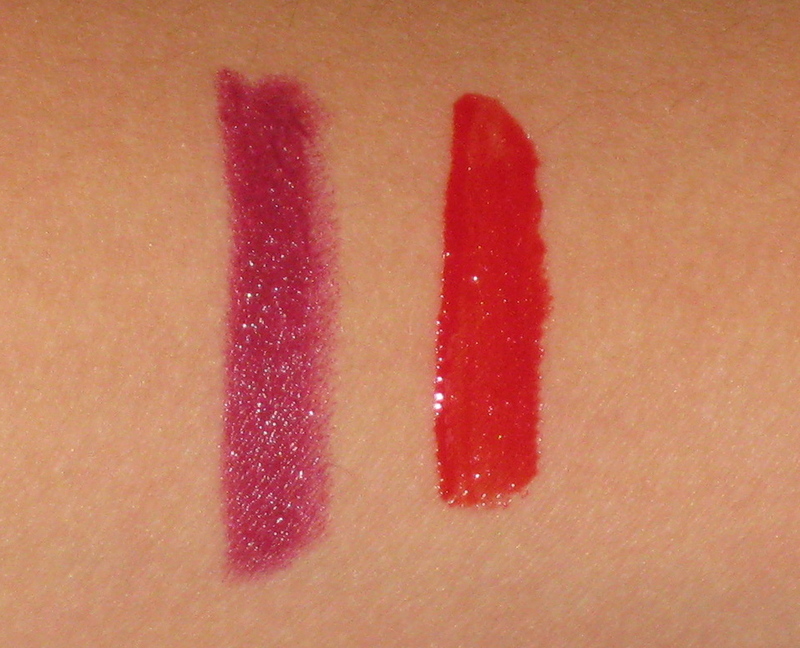 Dior Addict Fluid Stick 975 Minuit (reviewed here). Estee Lauder Pure Color Envy 210 Impulsive (reviewed here). MAC Pro Longwear Lipliner in Nice-n-Spicy, Estee Lauder Pure Color Envy 210 Impulsive topped with Dior Addict Fluid Stick 219 Whisper Beige. 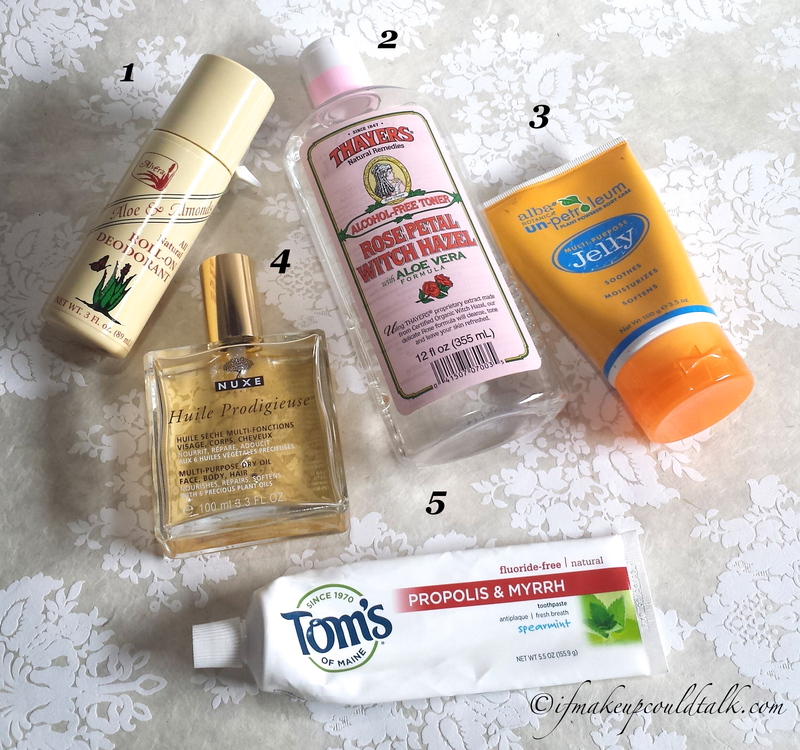 Alvera Natural Deodorant, Thayers Witch Hazel, Alba Un-Petrolum, Nuxe Huile Prodigieuse, Tom’s Fluoride-Free Toothpaste. Alvera All Natural Deodorant in Aloe & Almond is not completely all natural; it is formulated with Alcloxa (aluminum derivative) and is used during the spring/summer seasons. 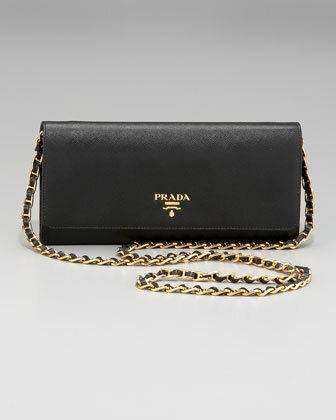 This has great odor protection. Thayers Rose Petal Witch Hazel is transfer into a spray bottle and used to dampen my makeup brushes. It is also used as facial toner after all makeup has been removed. Alba Un-Petrolum contains castor oil and coconut oil (saves me the trouble of combining the oils myself)–great moisturizer for arms, legs and face. Nuxe Huile Prodigieuse is a dry oil–great summer time facial moisturizer, but I like to combine it with Alba Un-Petrolum as my spring time facial moisturizer. Covert Affairs…amazing..especially season 3 and 4. Suits…Gabriel Macht was born to play Harvey Spector. 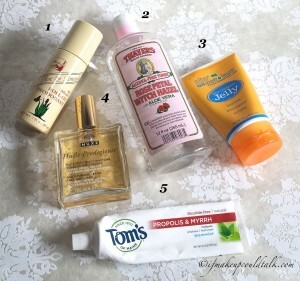 Makeup would tell you most of these products have been in my rotation for years, some have recently crept their way into my routine and others are seasonal delicacies. Regardless, I love them all. What are some of your favorites? Be well and stay safe. 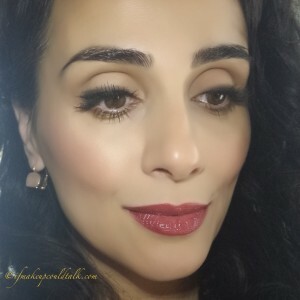 Nars Palais Royal Satin Lip Pencil. Nars Palais Royal ($25 US/ 2.2g) is a beautiful bordeaux color that does not translate as being too harsh on the lips. 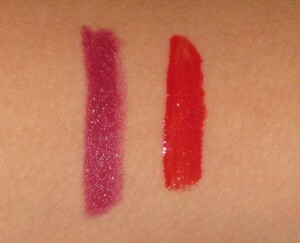 The Satin Lip Pencils are creamy and smooth and last for 3-4 hours depending on your lip activities. In my experience, the formula was not drying, but the dry-down color was not super moisturizing either. The color easily transferred if I happened to drink, eat or smooch. 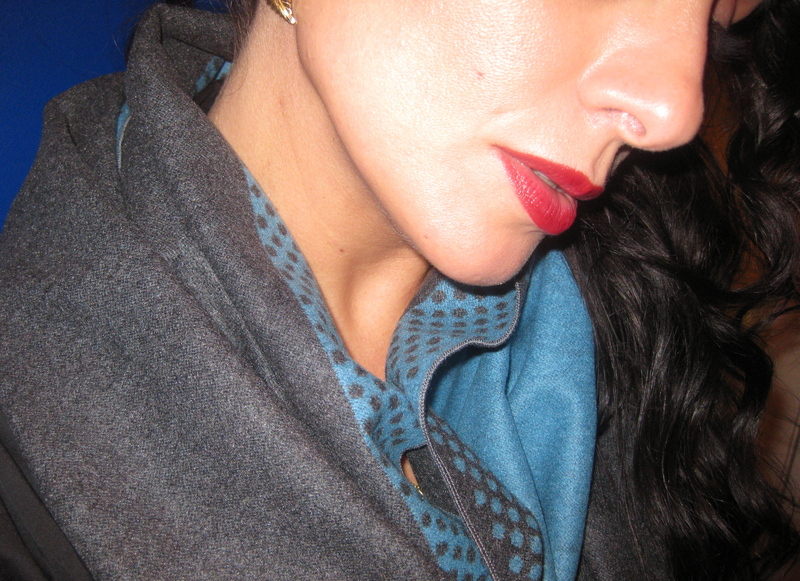 Palais Royal also feathered into my fine lines; a lipliner is a must with this color. Unfortunately, adding a lipliner defeats the purpose of lipstick-in-a-pencil-form concept. Regardless, the no paraben, fragrance and flavor-free factor is appealing… plus, I love the color so I will endure. Black Friday Makeup Find #2: Shiseido RD413 Lacquer Rouge. 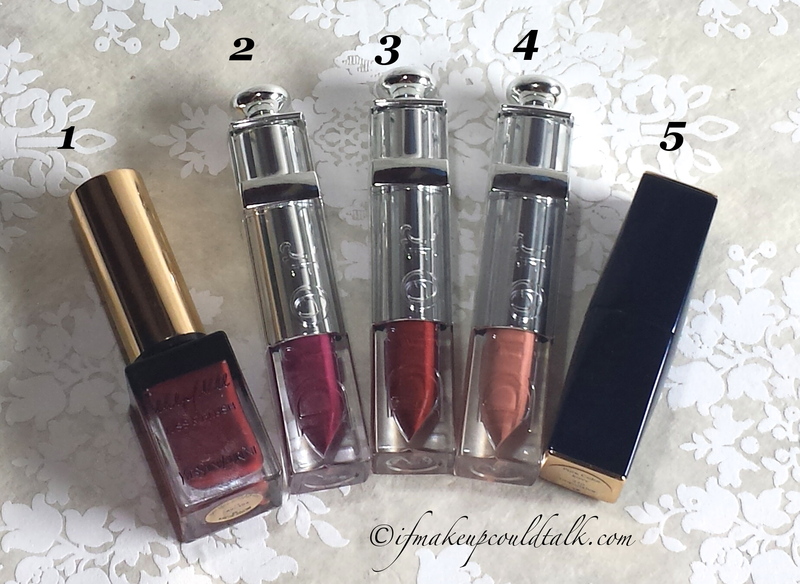 Do I need to talk about Shiseido’s Lacquer Rouge fabulousness any further? As you know, I love this formula. 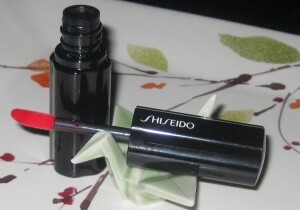 Shiseido RD413 ($25 US/ 6g) is a warm orange-red, the consistency of this color differs from my other Lacquer Rouge (reviewed here). The texture of RD413 has a gel-like feel, it is not as densely pigmented as my other Lacquer Rouge. I find the orange-red color very flattering on warm skin tones, and a perfect topper shade to add dimension to any darker colors. I paired RD413 with Paris Royal and the resulting color was stunning! The shine and color of RD413 gave Palais Royal a unique dimension. 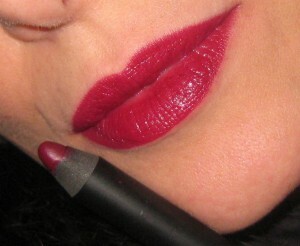 Nars Palais Royal Satin Lip Pencil with Shiseido RD413 in the center. 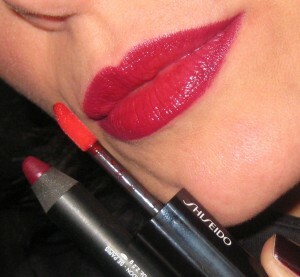 Nars Palais Royal, Shiseido RD413 Lacquer Rouge. 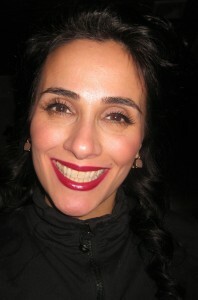 Wearing Nars Palais Royal with Shiseido RD413 Lacquer Rouge. 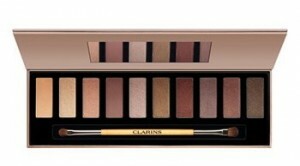 Clarins “The Essentials” Eyeshadow Palette. 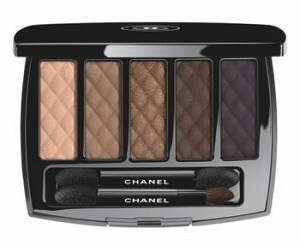 Chanel Ombes Matelassees Eyeshadow Palette. Clarins “The Essential” Eyeshadow Palette ($45 US/10 x 1.3 g) won me over immediately as soon as I felt the texture of the shadows. The combination of matte, satin and shimmer eyeshadows is all one would need to create any eye look. It’s competition, Chanel Ombres Matelassees Eyeshadow Palette ($80 US) was nice, but I could not justify the price for the amount offered. 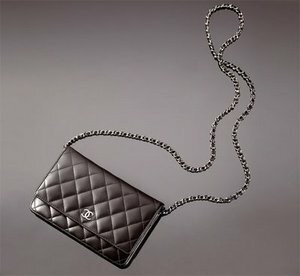 Chanel’s colors were very basic with the first two lighter shades barely visible on my skin tone. Clarins colors were buttery smooth with the exception of the first lighter shade that was chalky. Clarins eyeshadows can also be used wet to intensify the pigmentation and the accompanying brush is a rather convenient addition. The price of the Clarin’s palette was also very attractive (especially after my $20 discount). After testing both palettes, Clarins won in terms of texture, colors, and value. Clarins’s packaging is also reusable, after you are done with the eyeshadows you can use the case to store whatever you like. I am unable to swatch the colors, because the palette I purchased is intended to be given as a gift. However, you can see this palette in action (here). If you know someone who loves neutral eyeshadows, they will love this palette. The Essentials eye makeup palette by Clarins features 10 ultrasoft beige, taupe and brown eyeshadow shades in a variety of finishes designed to contour and highlight eyes. The palette was created as part of Clarins’ initiative to minimize environmental impact. 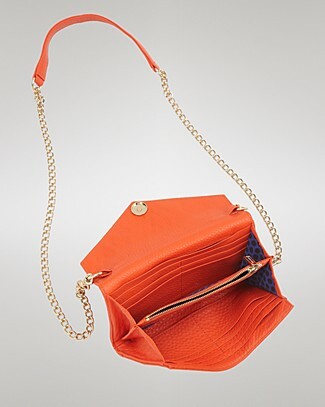 It features carefully selected materials and reusable packaging. Clarins has also joined forced with Pur Project and has committed to planting 10,000 trees for medical or cosmetic use, which will help revive the Kuntanawa culture (Amazonia). Nars Cosmetics, Shiseido Cosmetics and Clarins Beauty can be found in Lord & Taylor (were I purchased these products), Nordstrom, Sephora, Bloomingdale, Saks, etc.. Makeup would tell you to purchase gifts for others, you would use yourself. I did take advantage of the sales on Black Friday, but found restrain in purchasing other items simply for the sake of being on sale. I had lovely conversations with the sale associates and found them to be more pleasant when I asked how their day was going. Remember, be courteous, remain focused and more importantly, have fun shopping. Be well and stay safe. Ifmakeupcouldtalk.com is not affiliated with any brands mentioned, all products were purchased by me. Compensation is not given for any reviews. Click on each photo to enlarge. *Click on the rose highlighted words to take you to a direct link to each product. *All photos are property of Ifmakeupcouldtalk.com unless otherwise noted. Clarins “The Essential” Eyeshadow Palette photo and Chanel Palette photo courtesy of Nordstrom.com. Obsession #1: Neutral Eye Look. This can be easily achieved by utilizing your face powders as your sole eyeshadow for the mobile lid. MAC Too Chic Beauty Powder (seen here), Hourglass Ambient Powder in Diffused Light (reviewed here) and MAC Mineralized Skinfinish Natural all work beautifully for this purpose. 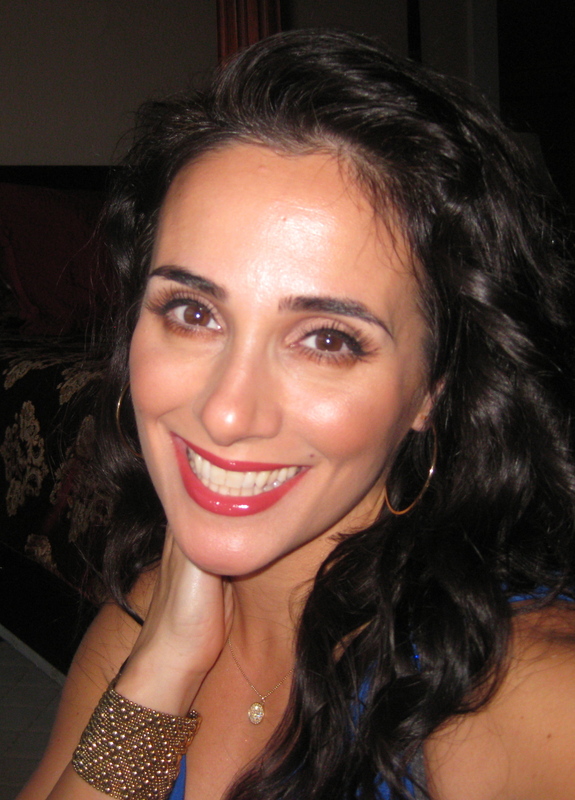 Use your blush as a crease color and lower lid color, add some mascara and liner and voila you are done. Bright, awake, youthful looking eyes are yours for the day. As an added bonus your makeup will done in half the time. Current Obsession #1: Neutral Eye Look. 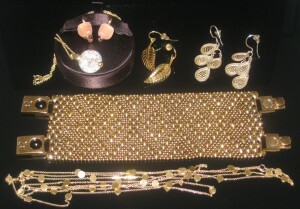 Obsession #2: Gold Tone Jewelry. Gold tone jewelry complements my shintone so much more than silver, white gold or platinum jewelry. My favorite designers range from Pomellato, Jennifer Meyer, to Anna Beck and Liquid Metal Bracelets by Sergio Gutierrez. Personally, I cannot pull off the ever so popular “statement necklaces” which seem to popping up everywhere. Whenever I try to wear an oversized necklace, I feel as if the necklace is wearing me and not the other way around. Simple and elegant, quality over quantity has been my mother’s mantra for years. I’m starting to see the wisdom in her theory. Current Obsession #2: Gold Jewelry. Current Obsession #3: Gold Tone Jewelry. There is no denying the cold chill looming in the air. Fall has arrived and I plan to be prepared for what follows. Vanity aside, every effort will be made to avoid illnesses of any kind this year; all exposed skin will be covered. Infinity scarves are a perfect way to combine style with utility. 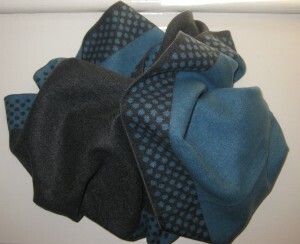 No messy fringe or bulky fabric to contend with, this Chelsey by Joseph Scarf is soft, warm and attractive. As an added bonus, neatly sewn ends detract dogs (my Yoshi) from chewing or grabbing. Current Obsession #3: Infinity scarves. Obsession #4: Tom Ford Eye Defining Pen. I just can’t get enough of this inky blacker than black double-sided liner (here). Official review coming soon. Don’t hate me..I know, I know the price is beyond ridiculous, but it really is such an ingenious design and formula! Darn you Tommy…I hate you…NO..I take that back…I really ♥ you! Current Obsession #4: Tom Ford Eye Defining Pen (01) Deeper. Tom Ford Eye Defining Pen on the upper lash line. Makeup would tell you to enjoy your healthy passions. Indulge when you can and abstain until you are able to get exactly what you want. What are you obsessing about lately? Be well and stay safe. 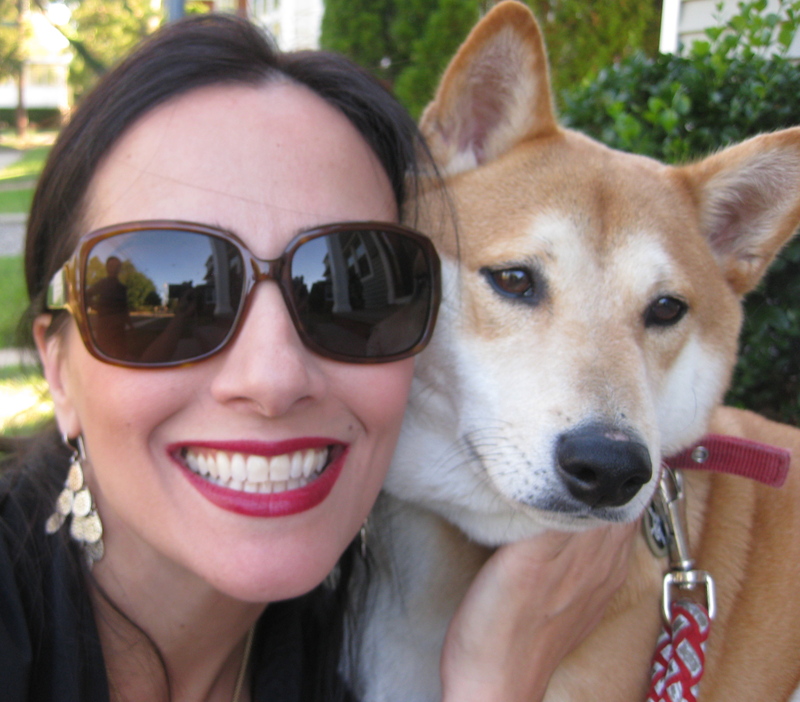 My permanent golden canine obsession…Yoshi.